Today, The Lancet have released the next instalment of the Global Burden of Disease Study, investigating the health effects of our diet. The analysis included data from 195 countries and assessed the impact of 15 different nutrients - including salt, whole grains, sugar-sweetened drinks and processed meat - on deaths and disability caused by non-communicable diseases, such as cardiovascular disease and cancer. Consumption of sugar-sweetened drinks was 16 times higher than the recommended level, and was highest in younger adults. Average global salt intake was 86% higher than recommended levels and was the leading dietary risk for deaths in China, Japan, and Thailand. 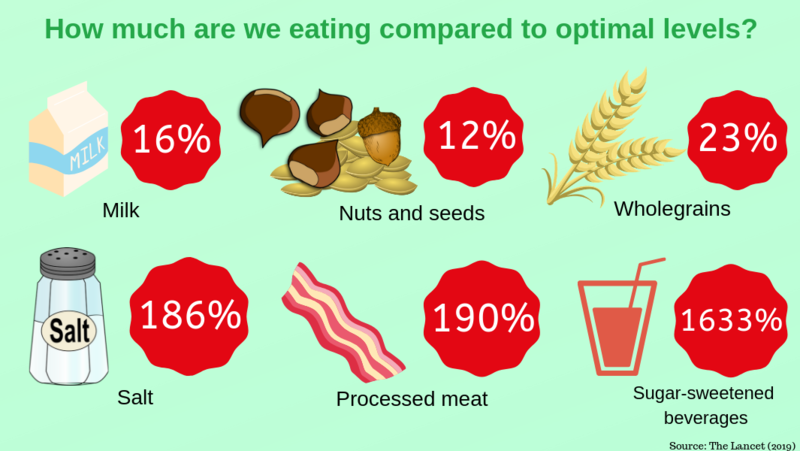 Intakes of healthier foods and nutrients was also lower than optimal intakes, with whole grain and nuts and seeds consumption at just 23% and 12% of optimal levels respectively. Among unhealthy food groups, consumption of sodium and sugar-sweetened beverages were higher than the optimal level in nearly every region.